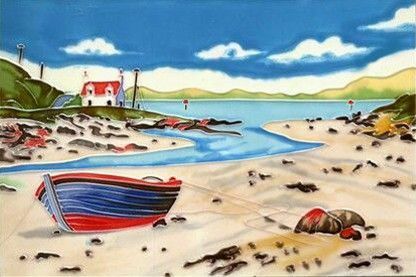 A hand painted decorative ceramic picture tile featuring the beautiful beach at Traigh Mhor on the island of Barra in the Outer Hebrides. This is a reproduction of a painting by the Barra artist Roger Gadd, one of many featured in our range. The beach is used as an airstrip serving the island at low tide, the only beach landing strip used for a scheduled air service in the world.